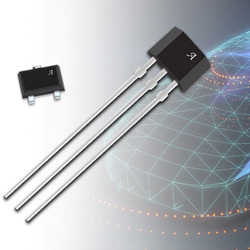 Allegro MicroSystems has released the APS11450 and APS12450, adding two Hall-effect sensor ICs to its expanding portfolio of solutions for systems that demand functional safety. The APS11450 is a family of unipolar switch ICs, while the APS12450 devices are bipolar latches. They are pin-compatible upgrades for current three-wire Hall switch and latch ICs produced in accordance with ISO 26262:2011 with ASIL-B capability (pending assessment). These magnetic sensors possess integrated self-test features that are constantly active in the background while the system is operating, leading to very short fault detection times. This operation is automatic, and the tests are performed so quickly (25µs, typical) as to be transparent to host system – even in the case of latches used in high-speed motors and encoders. The unique voltage-mode output communicates the sensor’s status while continuing to be backwards compatible with logic-level interfaces, application circuits, wiring, and firmware. The devices are provided in two packages, with magnetic characteristics that match legacy Hall sensors, enabling them to be highly flexible and easy to design with. These monolithic ICs can run from 3.3V to 24V and at up to 175C junction temperature, surviving up to +35V inputs, reverse-battery (-30V), output shorts, load-dump, and other over-voltage transients. The company’s miniature LH package is a SOT-23W style package for surface-mount applications; the UA is a three-pin, SiP for through-hole mounting. Both packages are lead (Pb) free, with 100% matt-tin lead frame plating.